The flat slab belongs to a reinforced concrete slab that may or may not contain drops. Usually, there are no beams to provide support to the slab. It contains columns with or without flared column heads. The column head is often expanded with the purpose of eliminating the punching shear in the slab. The expanded parts are known as column heads. These are arranged with any angle from the architectural point of view but for the design purpose, concrete in the part at 45 degree on either side of vertical only is treated as suitable for the design. 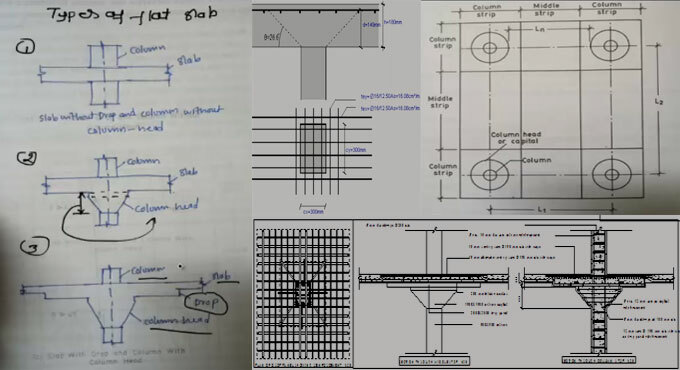 In this presentation, the renowned engineer, Parag Pal, has briefly explained the process for creating the design of the flat slab by adhering to IS 456-2000. This video focuses on the fundamental of flat slab and the clauses of IS 456-2000, and the numerical up to the absolute bending moment. In flat slab the highest -ve bending moment presents at the column strip in order that the drop is arranged to deal with the shear stress and as per IS 456 cl the 49% of -ve bending moment and 21% of +ve bending moment happens at column strip also 15% +ve and -ve bending moment happens at the middle strip of flat slab.